Micromold Y strainers are offered in PVDF and PTFE materials for ½" to 4" size pipelines. Micromold compliments the Hayward and Fluidtrol product lines quite well, offering the premium PVDF and Teflon materials for the small pipeline sizes and frequently used for aggressive fluids. All Micromold Y strainers area available with threaded and 150# class ANSI flange connections. 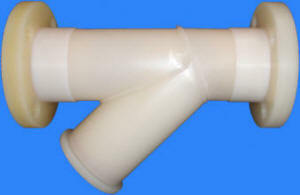 The PVDF models area also available with IPS or Metric weld connections; the PTFE version is available with tri-clamp connections. Micromold Y strainer screens are made of Tefzel® ETFE for 11, 17, 30 and 51 size mesh retentions. Screens made of PEEK are used for finer retentions of 65 to 400 mesh (155 to 12 microns).